CYBORG’S HERITAGE is an ongoing performative research by Burkhard Körner and Marc Philipp Gabriel. Both of us have backgrounds in classical music and are recent graduates from experimental choreography schools (SNDO Amsterdam / HZT Berlin). The idea for CYBORG’S HERITAGE grew out of an immense curiosity for what would happen if the specific modes and qualities of traditional western music making and the infinite possibilities and reflective processes of contemporary performance making start to inform each other: singing baroque music as part of a dance performance. What seems simple and obvious at first has undergone a crucial development that goes deeper than the superficial confrontation of both worlds. We are insisting on revealing the concepts, sub-layers, emotions, codes, conventions, taboos, patterns, mechanisms, social implications and relationships of each world, in order to explore what these inner layers can contribute to each other. 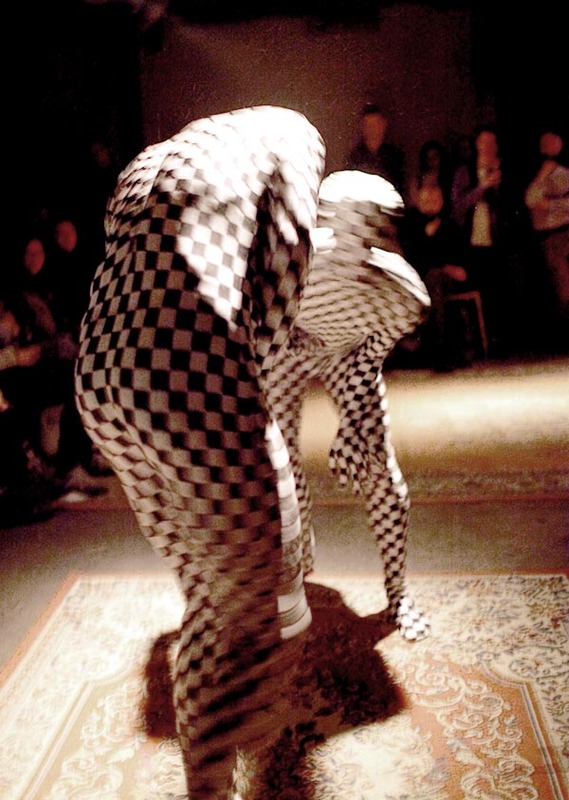 Starting from dissecting a vocal duet by Claudio Monteverdi and exploring physical approaches derived from partnering and contact improvisation, combined with pixelated full body suits, we began to summon a post-human digital body with permeable borders and fading individualities. We started exploring approaches derived from partnering and contact improvisation (in particular the symmetry practice of Jess Curtis and Maria F. Scaroni). Playing with modes of perception, flatness and universality on the visual level, the vocal level operates with individual timbres, social communication and emotional exchange between the two performers and the audience, moving on a fine line between comedy and seriousness. We are working on the physicality of a post-human body, a body that becomes object, that loses individuality and is seemingly entangled with the world of other beings. An incomplete organism. A post-identity-body that is yet pierced by its vocal heritage. M: It’s not fitting in. M: It is digging into our togetherness. B: Can you see the thing which is so inherent for us? M: It will be the non-human sounding of a butterfly. B: What if a tone can tell more than a movement? M: It is floating in delirium. B: I think this is a piece which wants to bridge what seems to be opposite. M: It is an urban dirty queer ritual club. B: Is this a human drama or an expression of contemporaneity? M: It is saying yes. B: It is an encounter of two Germans who are not where they come from. M: It is a caterpillar looking for transformation. B: It wants to channel our desire for music into contemporary performance. M: It is already there.